Making legitimate observations and/or making jokes typically shouldn’t have to result in an apology because someone else doesn’t have the brain capacity to understand the meaning of said observation or joke. So, it shouldn’t be all that surprising that a Bay Area, California sports writer would purposefully virtue signal all over the place in order to make himself look more tolerant while attempting to take better men down. 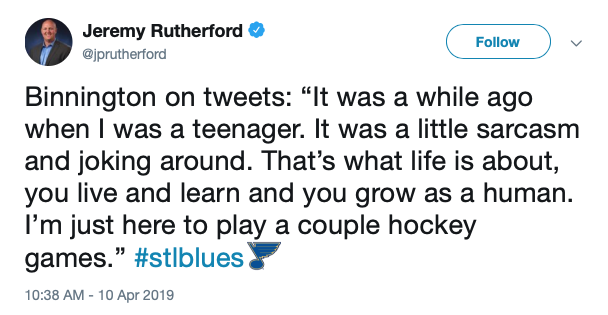 Luckily, St. Louis Blues goalie Jordan Binnington isn’t one of those people that feels the need to apologize for something that definitely doesn’t warrant an apology. For one, an apology is an admission of guilt. Bennington did nothing wrong, so there’s nothing to apologize for. 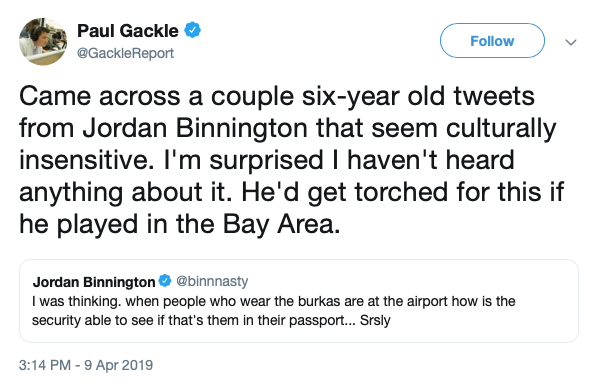 After having one of the more spectacular rookie season for a goalie in recent National Hockey League (NHL) history, San Jose, Calif.-area hack sports writer Paul Gackle decided to take it upon himself to dig through Binnington’s Twitter history for any tweets that could possibly be construed to anyone with the sensitivity level of a wet noodle as "offensive." For a guy that covers hockey, Gackle seems to have a pretty thin skin. Ah, Canada and the Bay Area of California — bastions of free speech. It’s become so bad that these people actually search for things to be offended by, and it’s typically about things that don’t even concern them. That’s the definition of a self-righteous virtue signaler. Perfect! 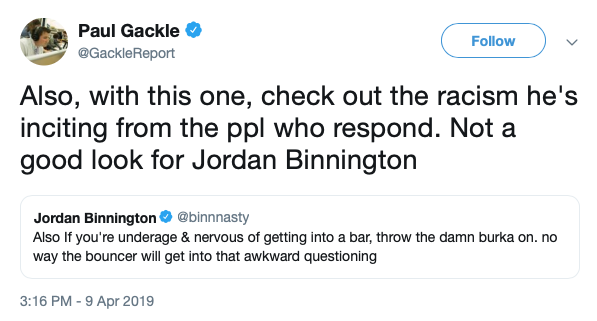 No need for an apology at all — unless you ask the delicate sensibilities of Gackle and McIntyre. I’ve been on the receiving end of so many ethnic jokes over the years, ironically by people that would claim their own “tolerance” today, but you don’t see me crying about it. Actually, I laughed at a lot of them back in the day. You know why? I have a sense of humor. Even if someone made an observation about me, who cares? I might’ve been hurt about it back then. Although, to be fair, I was a child or an immature young man. But, you get over it. Why? Because watching paint dry is literally more important than giving people that don’t matter any reason to believe their jokes or criticisms have weight. Stop being so sensitive, people. Words can most definitely hurt, but it’s how you deal with it that makes you who you are. You can choose to continue to be hurt to the point you feel action is needed, which is ridiculous. Or you can be mad about it for a short time, get over it and move on. No need to make yourself crazy over comments made by unimportant people. By the way, that mentality should also be applied towards people that search to take you down because their own lives are insignificant.